The lungs are connected to the trachea. Birds digest food quickly, they can't afford the extra weight. See if you can figure out what kind of lifestyle each of the birds below have. See photos of birds you might see in your backyard. 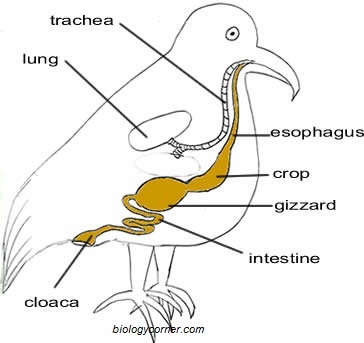 Birds are classified by the beaks and their feet. There are many bird orders, but here are some of the more common orders. *You will not need to know the orders, but you should know how the birds are grouped. For example, a hawk is more closely related to a falcon than it is to a bluebird. Some birds mate for life, and often both parents raise young. Eggs bought at the supermarket are not fertilized, you cannot incubate them to hatch a chick. The term "birdbrain" often describes someone who is stupid - in actuality, some birds are extremely intelligent and can be trained to do tricks and can solve puzzles. Some special terms to describe birds in groups.